Ireland for families? It makes perfect sense to me. Take the kids and go for the music, art, and shopping; stay for the hiking (so many), beaches (oh the tide pools), and ruins. 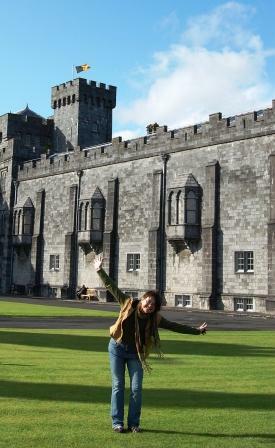 Goofing off on island time in Kilkenny. The country offers a uniquely European “island” experience complete with a pace in the countryside that matches a Sunday afternoon from 1952. Ireland is an excellent choice for families with children of any age but is ideal for travel with young adults because the country has a youthful energy. I think caused by the availability of rain. The respect and support for art and artists is obvious. And while they export plenty it is just possible that the best is saved for the homeland. We did not find Craig Ashurst and Chloey Turner with the cast of Riverdance at the airport but we did find plenty of live music interspersed with laughter. For music the list of artists is long and includes both traditional folk music not just Celtic Thunder as well as contemporary bands including The Script, more suited to teens and young adults. For art my favorite spots include the remarkable sculpture field at Lough Boora Parklands and the inspiring National Craft Gallery in Kilkenny. The carved crosses at Clonmacnoise are of stone rubbing quality and the stained glass windows at St. Canice Cathedral need no endorsements. For shopping I love All Saints and fortunately there is a smaller version of Spitalfields in Dublin. And of course there’s a tempting H&M not far away both dare I say in Temple Bar. The National Craft Centre in Kilkenny has tempting, high quality items including delightful children’s clothing, woolens, and beautiful contemporary jewelry. Plus we found an array of clever shops not far from the castle in the city centre. Galway has the Claddagh ring and Connemara’s Sheep & Wool Centre near Leenane has amazing yarn. The bottom line for families, Ireland is safe, friendly, and fun. For parents or grandparents’ with wee ones there’s delightful folklore to be shared plus plenty of parks, playgrounds, tide pools, and pony trekking. For teens and young adults the list spans castles, cathedrals, ruins, hiking, biking, and surfing to music, falconry, shopping, and pubs. Ireland is the perfect European island experience.